You embark on something that makes your heart sing. So you’re feeling good and share it with a friend, who puts you down in some way. Here you were in a bubble of happiness and the person sticks a pin into it. Unhappy people sometimes can’t handle seeing someone else’s delighted joy and must say something negative to try to bring you down to their level of unhappiness. Because I live an unconventional life, I’ve been stung by people for doing a variety of things. I have to keep reminding myself that they’re unhappy and that is making them want to hurt my happiness. After all, if she’s not happy, why should anyone else be? And sadly, there are a lot of unhappy people who like to burst happiness bubbles. I’ve met too many of them over the years and heard awful stories from clients who’ve been stung by one. I don’t think these people are conscious of doing it. Unhappy people get bitter and react negatively as a lifestyle. If you recognize this in yourself, I strongly advise you to curtail this habit. Just because you’re hurting, you don’t have the right to hurt others. Envy can blind you to understanding how mean it is to pick apart what someone is happy about. It can become an unhappy habit that poisons your life and your spirit. Oh boy do I know some of these! If you have someone in your life who likes to regularly rain on your parade, I highly advise you to cut your ties if possible. You can try to explain how they make you feel but envy and bitterness can block their understanding. I’ve let go of friends I had for years when I finally accepted that I was tired of them sticking pins in my happiness. Spending time with only supportive friends is a great act of self-love. This doesn’t mean they can’t give you honest feedback, but they do it in a way that is diplomatic and with a clear intention to help. Actually It can be hard to let go of someone you’ve known for a long time. They may put up a fight. But negative people don’t just change because you tell them you don’t like it. They have a right to be their negative mean selves and you have a right to detach from them! If there’s someone you can’t let go of, possibly a family member, limit your interactions. Set boundaries. Say that you won’t tolerate their negative barbs anymore and don’t! If the person is determined not to lose you, come up with something you can say at times when they say things you don’t like. A word or two, as simple as “negative alert!” or a warning, “Remember our talk. You’re doing it.” can stop their barbs. The most important thing is to love yourself enough not to subject yourself to behavior that hurts you or dampens your happiness. Everyone is responsible for him/herself. No one has the right to take their problems out on others and you shouldn’t allow them to because you feel sorry for them. I’ve been able to continue interaction with some negative people by letting them know I’d get up and leave or hang the phone or delete the email if they barbed me. 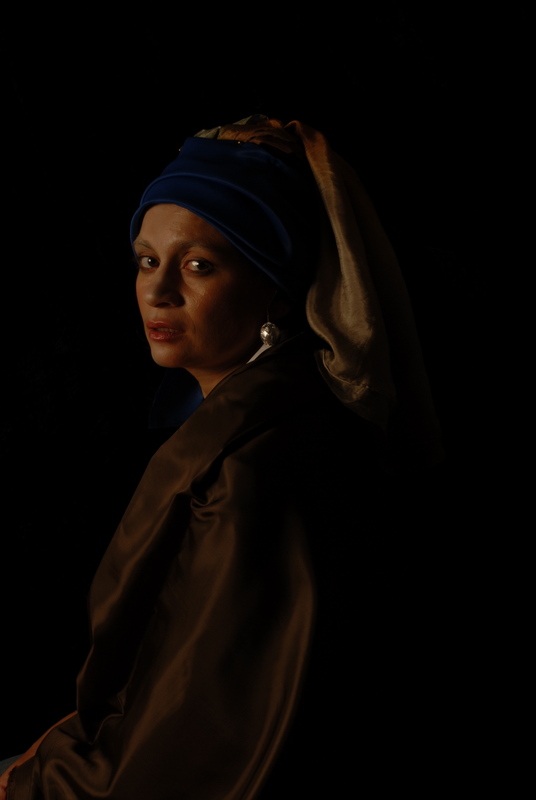 Voila: Ibi channeled Vermeer’s model. This was a great project – it was good to have faith in it and to follow it through.